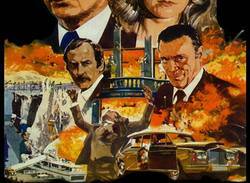 For those who have seen The Take (a four-part British mini-series starring Tom Hardy) or for those who appreciate the differences between British and American gangster films, you may want to take a look at The Long Good Friday. Finished in 1979 and released in 1980, The Long Good Friday is a bleak crime drama starring Bob Hoskins. Set around the Catholic holiday, Good Friday, the film forward with many memorable cultural and relevant societal references. I have categorized Bullitt as a time capsule for 1960s San Francisco and would put The Long Good Friday in a similar light. The period of the film provides relevant context for the film’s story. This unique trait could only be re-created now, not captured as it is in this film. What have become modern character clichés can be seen in a more effectively presented fashion: the second-hand guy who overextends himself, the silent hitmen, and the members of the crew who are close to the boss but have facial expressions that question the decisions being made in front of them. The film’s lead actors, Bob Hoskins and Helen Mirren, deliver strong performances that help put this film into an elite echelon that could inspire those who hope to become actors. There is a beautifully disastrous cloud hanging over the film and Hoskins’ character himself wears every possible human emotion on his face throughout. His broad scope of emotion tightens his grip on the character and the viewers’ attention, even while some may know where his fate will ultimately lie. Mirren plays Hoskins’ wife, whose shifty character has as much charisma as guts. She is a calculating individual who knows how to get where she wants to be and she handles the emotional stress like a champion, going so far as to keep Hoskins moving towards his own goals when he falters. Her character is not outwardly malicious or loud; she actually plays an essential part in helping the viewer understand the motives and purposes of the characters. In one scene she not only processes a very confusing violent act by Hoskins, but she bypasses any emotional criticism of said act and gets him focused within roughly two minutes where he would otherwise have derailed. Such critical moments of transition within the film are presented by appropriate and aggressive sections from the film’s score. The music avoids pointless fade-outs and the segments are purposeful and effective in emotional translation. It acts as a complement to the emotional or physical movement of the characters. In Fulci's Zombie, or Carpenter’s Halloween, the score acts to signal the presence of characters or emotional states, as well as shifts in the action. The Long Good Friday has familiar intent in its use of a scored soundtrack. You can hear traces of similar music in subsequent 1980s crime thrillers. The photography provides a look at a lot of areas that have drastically changed in industry, as well as normal changes in the earth as time moves on. The London docks provide a large size set piece. There is a great interior section of a restaurant that reminded me of the whole intro sequence to Indiana Jones and the Temple of Doom. The movie is based heavily on conversation and props. The spatial organization of the film’s photography is comfortable and pulls the viewer’s focus to the important aspects of what is happening via conversations, action, etc. The pursuit of financial success and nationalism are foundations for the characters’ conflicts in The Long Good Friday. Those elements served the writers in their creation of the story and give the film intense feelings of realism. Tensions between the IRA and British army/police have been documented and Friday includes lingering issues in prominent moments of the film. (Note: read more on ‘the Good Friday Agreement’ for further historical context that takes place well after the setting of this film). Great Britain suffered through financial difficulty in the 1970s regarding management of the country’s economy. A labor strike led to political change which did not make it to the 1980s before similar events reoccurred and brought about more change. The effects of such a cycle are felt in The Long Good Friday as Hoskins’ character races to reach a point of financial security: a “new life.” His race is presented as tangible obstacles in the film which represent the cycle of change that many people endured at that time. This film provides viewers with a look at a time and place that they might not have otherwise experienced. The Long Good Friday is completely relevant today and it holds up as a unique period piece. In such a film where historical elements are intentionally incorporated, the viewer can see where fiction reflects reality and how good fiction is derived from observations in the world around us. Posted on Feb. 17, 2014, 1:53 p.m.
Posted by BJ Rochinich on Feb. 17, 2014, 1:53 p.m.